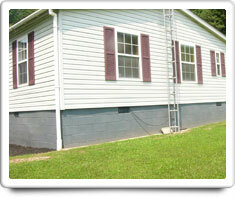 Your home's Foundation is the concrete or stone structure on which your home sits. If you do not have a basement, then the footers will be buried below where your outside walls meet the ground. In some homes, the footers and the Foundation will be continuous around the outside perimeter of the home, and it other homes the footers for the Foundation will be spaced in intervals around the outside walls and in places underneath the middle of the home, with the house structure sitting on posts which rest on top of the individual footer locations. This latter type of Foundation will typically have a 'crawl space' between the ground and the wooden structure which forms the support flooring for the house. Shown in the 'Routine Care' section are the recommended routine maintenance tasks for your foundation. The 'Q & A' section shows answers to common questions. And the 'Articles' section provides helpful articles about your foundation.